Andersen, J. B. (1994). “Transition zone diffraction by multiple edges”, IEEE Proceedings Microwave Antennas and Propagation, UK. Andersen, J. B. (1997). “UTD multiple-edge transition zone diffraction”, IEEE Transactions on Antennas and Propagation, Cilt 45, 1093–1097. Balanis, C.A. (1989). Advanced Engineering Electromagnetics, John Wiley & Sons, New York, USA. Bertoni,H.L. (2000). Radio Propagation for Modern Wireless Systems, Prentice-Hall, New Jersey, USA. Borovikov, V.A. and Kinber, B.E. (1994). Geometrical Theory of Diffraction, Institution of Electrical Engineers, London, UK. Causebrook, J.H. and Davies, B. (1971). “Tropospheric radio wave propagation over irregular terrain: The computation of fielld strength for UHF broadcasting”, BCC Research Department Report RD 1971/43. Chung, H. K. and Bertoni, H. L. (2002). “Range-dependent path-loss model in residential areas for the VHF and UHF bands”, IEEE Transaction on Antennas and Propagation, Cilt 50, No 1, 1-11. Chung, H.K. (2000). Radio Channel Studies from 30 MHz to 5 GHz, Ph.D. Thesis. Graduated School Polytechnic Institute of New York University. Chung, H. K and Bertoni, H. L. (2003). “Application of isolated diffraction edge method for urban microwave path loss prediction”, IEEE Vehicular Technology Conference, USA. Clarkowski, A., Boersma, J. and Mittra, R. (1984). “Plane-Wave Diffraction by a Wedge-A spectral Domain Approach”, IEEE Trans. on Antenna. Propagat., Cilt 32, No 1, 20-29. Deygout, J. (1966). “Multiple knife-edge diffraction of microwaves”, IEEE Trans. Antennas Prorpagat, Cilt 14, 480-489, 1966. Deygout, J. (1991). “Correction factor for multiple knife-edge diffraction”, IEEE Trans. Antennas Prorpagat, Cilt 39, 1256-1258. Giovaneli, C.L. (1984). “An analysis of simplified solutions for multiple knife-edge diffraction”, IEEE Trans. on Antenna. Propagat., Cilt 32, 297-301, 1984. Graeme, L.J. (1976). Geometrical Theory of Diffraction for Electromagnetic Waves, Institution of Electrical Engineers, London, UK, 1976. Harrington, R.F. (1966). Field Computation by Moment Methods. IEEE Press Series, New Jersey, USA. Holm, P. D. (1996). “UTD-Diffraction Coefficients for Higher Order Wedge Diffracted Fields”, IEEE Transactions on Antennas and Propagation, Cilt 4, No 6, 879-888. Holm, P. D. (2000). “A new heuristic UTD Diffraction Coefficients for nonperfectly conducting wedges”, IEEE Transactions on Antennas and Propagation, Cilt 48, 1211-1219. Holm, P. D. (2004). “Calculation of Higher Order Diffracted Fields for Multiple-Edge Transition Zone Diffraction”, IEEE Transactions on Antennas and Propagation, Cilt 52, No 5, 1350-1355. Karousos, A. and Tzaras, C. (2008). “Multi Time-Domain Diffraction for UWB Signals”, IEEE Transactions on Antennas and Propagation, Cilt 56, No 5, 1420-1427. Keller, J.B. (1962). “Geometrical Theory of Diffraction”, J. Opt. Soc. Amer., Cilt 52, No 2, 116-130, 1962. Koutitas, G. and Tzaras, C. (2006). “A Slope UTD Solution for a Cascade of Multishaped Canonical objects”, IEEE Transactions on Antennas and Propagation, Cilt 54, No 10, 2969- 2976. Kouyoumjian, R. G. and Pathak, P. H. (1974). “A uniform geometrical theory of diffraction for an edge in a perfectly conducting surface”, Proceedings of the IEEE, Cilt 62, 1448–1461. Lee, M.B.R., Saunders, S.R., Tzaras, C., Montiel, E. and Scrivens, J. (2002). “The Digiplan project: Coverage prediction for digital broadcast services”, BBC White Paper 047. Luebbers, R.J., (1984). “Finite conductivity uniform GTD versus knife edge diffraction in prediction of propagation path loss”, IEEE Trans. Antennas Propagat, Cilt 32, 70-76. Macdonald, H.M. (1912). “The effect produced by an obstacle on a train of electric waves”, Phil. Trans.Royal Soc. London, Series A, Math. Phys. Sc., Cilt 212, 299-337, 1912. Maliuzhinets, G.D. (1958). “Excitation, reflection and emission of surface waves from a wedge with given face impedances”, Sov. Phys. Dokl., Cilt 3, No 4, 752-755. Martínez-Inglés, M.T., Rodríguez, J.V., Molina-Garcia-Pardo, J.M., Pascual-García, J. and Juan-Llácer, L. (2013). “Comparison of a UTD-PO Formulation for Multiple-Plateau Diffraction with Measurements at 62 GHz”, Cilt 61, No 2, 1000-1003. Rahmat-Sami, Y. and Mittra, R. (1976). “On the investigation of diffracted fields at the shadow boundaries of staggered parallel paltes-A spectral domain approach”, Radio Science, Cilt 12, No 5, 659-670. Rizk, K., Valenzuela, R., Chizhik, D. and Gardiol, F. (1998). “Application of the slope diffraction method for urban microwave propagation prediction”, IEEE Vehicular Technology Conference, Canada. Rodriguez, J.V., Molina-Garcia-Pardo, J.M. and Leandro, J.L. (2005). “An Improved Solution Expressed in Terms of UTD Coefficients for Multiple Building Diffraction of Plane Waves”, IEEE Antennas and Wireless Propagation Letters, Cilt 4, 16-19. Rodriguez, J.V., Molina-Garcia-Pardo, J.M. and Leandro, J.L. (2008). “A Hybrid UTD-PO Solution for Multiple-Cylinder Diffraction Analysis Assuming Spherical-Wave Incidence”, IEEE Transactions on Antennas and Propagation, Cilt 56, No 9, 3078-3081. Rodriguez, J.V., Molina-Garcia-Pardo, J.M. and Leandro, J.L. (2009). “UTD-PO Formulation for the Multiple-Diffraction of Spherical Waves by an Array of Multimodeled Obstacles”, IEEE Antennas and Wireless Propagation Letters, Cilt 8, 379-382. Schneider, M. and Luebbers, R.J. (1989). “A Uniform double diffraction coefficient”, Antennas and Propagation Society International Symposium (AP-S), 3, 1270-1273, Digest. Tabakcioglu, M. B. and A. Kara (2009). “Comparison of improved slope UTD method with UTD based methods and physical optic solution for multiple building diffractions”, Electromagnetics, Cilt 29, No 4, 303–320. Tabakcioglu, M. B. and A. Kara (2010). “Improvements on Slope Diffraction for Multiple Wedges”, Electromagnetics, Cilt 30, No 3, 285-296. Tabakcioglu, M. B. and A. Cansiz (2013). “Application of S-UTD-CH Model into Multiple Diffraction Scenarios”, International Journal of Antennas and Propagation, Cilt 2013,1-5. Tajvidy, A., Ghorbani, A. (2008). “A New Uniform Theory-of-Diffraction-Based Model for the Multiple Building Diffraction of Spherical Waves in Microcell Environments”, Electromagnetics, Cilt 28, No 5, 75-387. Tiberio, R. and Kouyoumjian, R.G. (1982). “An analysis of diffraction at edges illuminated by transition region fields”, Radio Science, Cilt 17, No 2, 323-336. Torabi, E., Ghorbani, R. and Tajvidy, A. (2009). “A Modified Diffraction Coefficient for Imperfect Conducting Wedges and Buildings With Finite Dimensions”, IEEE Transactions on Antennas and Propagation, Cilt 57, No 4, 1197-1207. Tzaras, C. and Saunders, S.R. (2000). “Comparison of multiple-diffraction models for digital broadcasting coverage prediction”, IEEE Trans. Broadcast., Cilt 46, No 3, 221-226. Tzaras, C. and Saunders, S. R. (2001). “An improved heuristic UTD solution for multiple- edge transition zone diffraction”, IEEE Transactions on Antennas and Propagation,Cilt 49, No 12, 1678–1682. Ufimtsev, P.Y. (2007). Fundamentals of the Physical Theory of Diffraction, John Wiley & Sons, New Jersey, USA. Umul, Z. (2004). “Modified theory of physical optics”, Optics Express, Cilt 12, No 20, 4959- 4972. Walfisch, J. and Bertoni, H.L. (1988). “A theoretical model of UHF propagation in urban environment”, IEEE Trans. on Antenna. Propagat., Cilt 36, No 12, 1788-1796. Wang, H. (2005). “Modeling and Wideband characterization of Radio wave propagation”, Ph.D. Thesis, The University of Texas at Austin. Vogler, L. (1982). “An attenuation function for multiple knife-edge diffraction”, Radio Science, Cilt 17, 1541–1546. Yalcin, U. (2009). “Uniform Scattered Fields of the Extended Theory of Boundary Diffraction Wave for PEC Surfaces”, Progress In Electromagnetics Research M, Cilt 7, 29- 39. Makale 25.06.2012 tarihinde alınmış, 10.07.2013 tarihinde düzeltilmiş, 25.02.2014 tarihinde kabul edilmiştir. ISNAD TABAKCIOĞLU, Mehmet Barış , CANSIZ, Ahmet . "Çoklu Kırınımlar İçeren Senaryolar için Elektromanyetik Dalga Yayılım Modelleri". 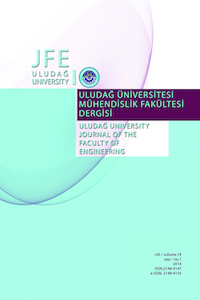 Uludağ University Journal of The Faculty of Engineering 19 / 1 (April 2014): 37-46.